The day after my last post of new wallpapers we had an electrical storm and it knocked out my network. In fact, it damaged my router. So I spent a couple of days trying to figure out what was going on, which turned out to be all the free time I had for making posts in the past couple of weeks. I have spent the time since getting everything fixed and replaced. I am now busy working on a new series of maps for work. I have quite a few wallpapers to post and hope to get at least one set posted by Monday and the rest will follow sometime next week. A couple of weeks ago I was contacted by Darren Nelsen, a musician who was working on a fractal music project, about using one of the fractals for a cover for his project. You can check out the finished music (along with the cover) on Darren Nelsen's website. I was surprised by the music he came up with, very meditational and calming, I expected something a bit more chaotic since it is composed using fractals. I have created a theme for an Xbox 360 for a content creation contest. 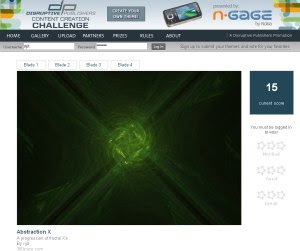 Disruptive Publishers and N-Gage have a contest going on to get published on Xbox Live. I need some help with the voting though, I am behind in the contest by a few weeks since I did not hear about it till last week. So, if you are willing, would you go by my themes vote page and vote? Just click the image below to be taken directly to the vote page.